Can you identify glacial features while driving down the road? Did you know that everything in the Upper Midwest would look completely different if glaciers hadn’t been here? Download the free companion lesson guide to practice finding the “coolest” features around. You’ll become familiar with glacial vocabulary and will find yourself learning faster than the speed of a moving glacier. A lot faster. If you are an elementary or high school student, take a look at the additional lesson content provided below. Click the link below to get started. Is it possible to identify glacial features while driving down the road? Discover the answers by watching this Serious Science video and reading the information below. 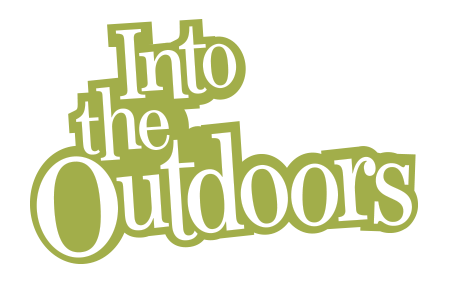 And to take this learning adventure into your classroom, have your teacher download the free Lesson Activities at the bottom of this page so everyone can share in the fun of this inquiry based learning. You might not realize it, but much of the Midwestern landscape that we see today was shaped by continental glaciers between 15,000 to 25,000 years ago. Hey, we wouldn’t kid you, it’s for real. These glaciers shaped the land in several ways. The ice that flowed slowly across the land both sculpted and deposited certain glacial features under the ice. When the ice front stopped flowing, ice meting at the front of the glacier deposited soils, sand and rocks trapped in the ice and formed other features. Even rivers that flowed on top of and beneath the glaciers deposited sand and gravel that formed some odd features. So what are some of these ice age features and how can we identify them? Okay we know that you’re not a glacial geologist, but we’ll give you an edge by using your computer. To learn how, simply watch this video. Yeah, we suppose you could take some notes while you’re at it, plus, read the “Learn More” section. To really explore some cool stuff about the landscape, use the Companion Lesson Guide below in your school so the whole class can become earth science geeks. Okay, we’ll admit that these features are often too big to get a good perspective of viewing them from the ground. So earth scientists study these features using maps and aerial images from high above the ground. One type of map in particular helps scientists locate and identify glacial features. It’s called a topographic map. These maps show irregular contour lines of different elevations that help reveal the “topography” or shape of the landscape. 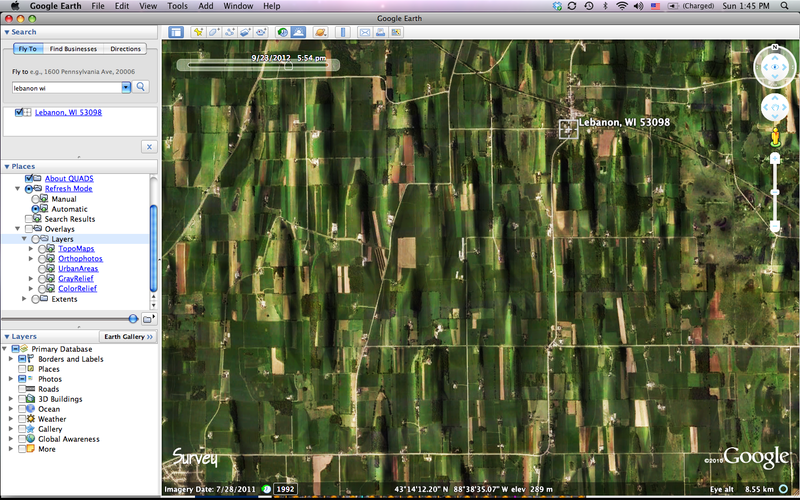 This will allow you to zoom in on areas where you live to study the shape of the land. Be sure to set the time of day to early morning or before sunset to make the shadows on the landscape appear darker. That helps see the contour or shape of the land. 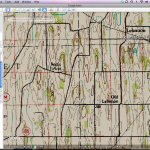 Next, to also view topographic maps as a layer in Google Earth, download the free “QUADS” plug in. http://www.metzgerwillard.us/quads/quads.html. This neat plugin will allow you to simply click and turn on a number of map views that will help you see glacial features in an area. Now let’s begin exploring an interesting glacial feature in Wisconsin called a “drumlin”. Drumlins are long hills that were shaped underneath ice as it moved. The alignment of these long, teardrop shaped hills reveals the direction that the ice moved. Wisconsin has thousands of drumlins. But you need to know what to look for to find them. 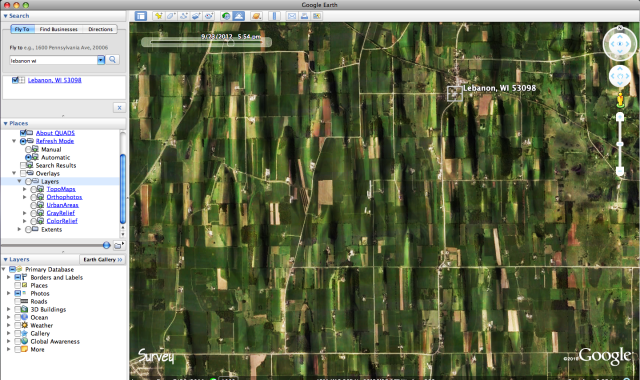 Look for the town of Lebanon, Wisconsin shown with shaded view using Google Earth. The long north-south hills are drumlins. There are about 40 drumlins in this picture. 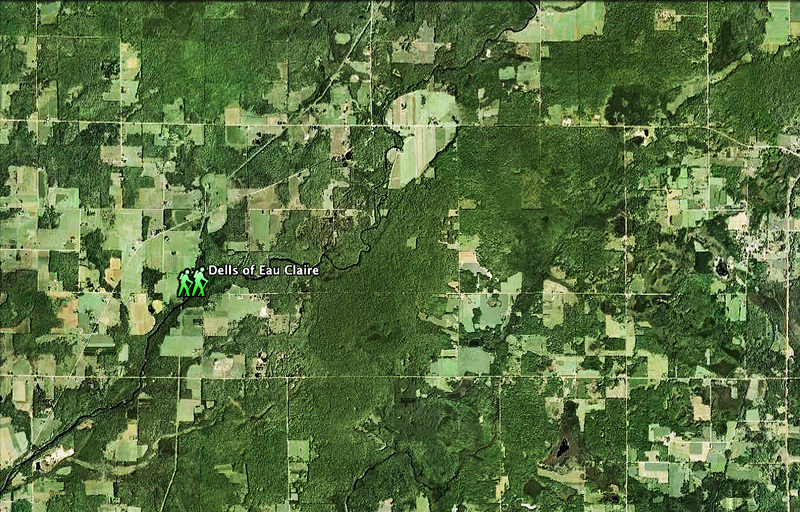 If you explore this area using Google Earth, you’ll find thousands of drumlins around here. Before aerial images like this, scientists viewed and studied topographic maps. To see the topographic map, simply click on that layer. 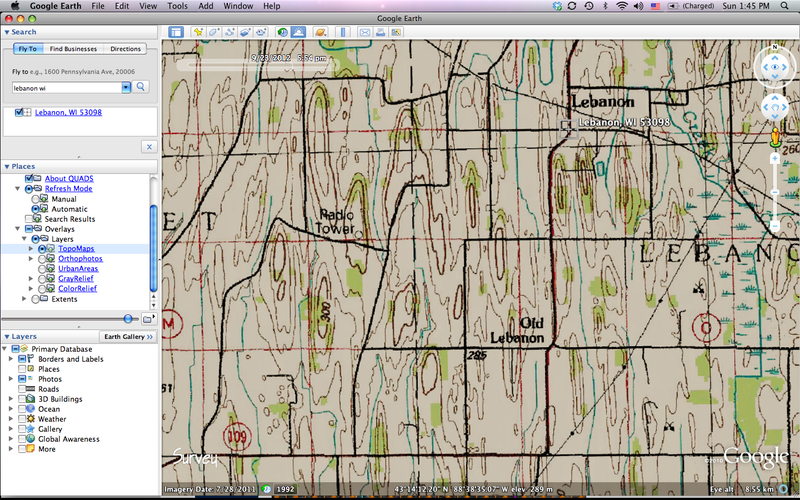 Here’s what the same area looks like on a “topo” map. Study the contour lines to see how they also define the shape and linear direction of the drumlins. One of the best ways to see the details and shapes of these glacial drumlins would be to fly over them in an airplane when the ground was covered with a layer of snow at sunrise. Okay, so you can’t do that very easily. But you can still see them in a similar way with a simple click on your computer. Just check the “grey relief” button on the QUAD plug in for Google Earth. Now you can see the amazing detail of how the glacial ice sheet shaped the land as it flowed south. Using screen capture, and some photo enhancing software, you can print these images, then take a field trip with your family to actually see and photograph drumlins from the ground. 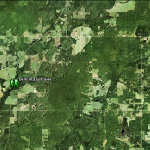 Now that you know how to “fly” in Google Earth, you can explore all kinds of glacial features in Wisconsin. To get started, you can begin checking out features and maps on the Geology of Wisconsin website. Let’s give it a try. Click on “Kettle Moraine State Forest” to discover what it is and where it’s located. These series of rugged ridges mark where the front of the glaciers were at one time. The moraines formed when sand and gravel deposited at the front of the melting glacier. The kettle lakes were formed from giant chunks of ice that broke off and got buried. So let’s see what these glacial features look like using your computer. 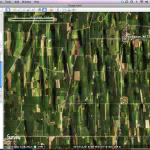 Watch the video to see what the Google Earth aerial view looks like. See the line of kettle lakes. Those ridges are the moraines. Here’s what it looks like on a topographic map. The contour lines here really show the shape of the moraine. And finally, here is the grey relief view, showing the detail of the surface. Then share your findings with your classroom or ice age trail friends. 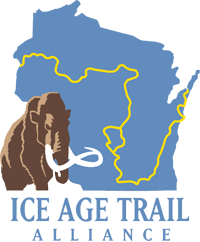 Once you’ve located some interesting finds along the Ice Age Trail using your computer, plan a field trip to explore these features from the ground to get a true sense of the power of the ice age forces that shaped our landscape. How Do Glaciers Move and Scratch Rocks? • A dell is a gorge cut by torrents of meltwater released by a melting glacier or draining of glacial lakes. Some dramatic examples are the Dells of the Eau Claire, the Wisconsin Dells and the Dalles of St. Croix. • Drumlins are elongated, teardrop-shaped hills. These streamlined hills were sculpted in the direction of the glacial ice movement. They often occur in groups known as swarms.